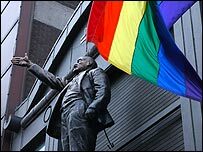 Protesters against a gay rights parade in Belfast say they will be seeking sanctions against it next year because of the behaviour of some marchers. The Stop the Parades Coalition, which failed to get the Parades Commission to ban it, said some participants broke agreed guidelines by shouting abuse. The organisers of the Gay Pride march said it was the most successful yet, with over 4,500 people taking part. Police said there were no reports of any trouble during the parade. 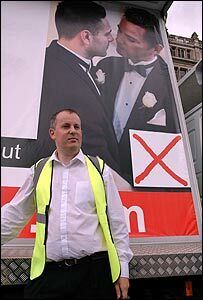 Stop the Parades Coalition spokesman James Dowson said they were called "bigots and religious fundamentalist murderers" by some marchers. "We will be going down the avenue next year of hopefully getting sanctions applied to the parade to make sure they fall into the confines," he said. "We are doing what we said we would do - unfortunately they have broken their word and behaved in a very inappropriate way again." 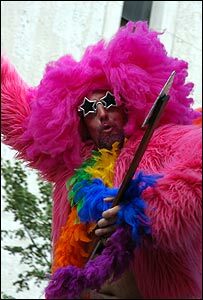 Parade steward Andrew David Clarke said he felt the 15th annual Gay Pride march had passed off peacefully. "I do understand people have different concerns about it," he said. "Thankfully today we have been able to have our peaceful, fun parade, the protests have gone extremely peacefully, and I would commend everybody on the ground." "If you don't want to see what is going on on Royal Avenue, stay away for an hour - it's only for an hour every year"
The gay scene in Belfast goes right back to the 1960s. There were always bars in Belfast where people knew they could meet other people and there were various other places. The scene now is the best there's ever been. Belfast has never had it so good. During the Troubles not many people would go into the city centre and the town was empty so we were more or less left to our own devices and it was a very interesting time. The main hotels were very well known for quite a big gay component. There were a few of the bigger bars and clubs which were owned by gay people. So I found it very easy in those days. At one stage during the Troubles, there was only one bar going because of the bombs but everybody, from both communities, was together. I mean there was a bit of friendly banter but it was never venomous. It's a funny thing that when the Troubles started to abate places that courted the gay business actually started to reject the gay business. I suppose in a way it's a form of homophobia. A lot of people fought to get into these places but, like, if they don't want my money, I'll take my money elsewhere and vote with my feet. So then gay people started getting their own acts together and opening their own places which I think is a very good thing. I think people had been so busy and locked up in the Troubles that they didn't bother with gay people and there hadn't been as much queer-bashing. And then all of a sudden people had a lot less to do with their time and they started going into town and so gay people became more visible in Belfast and that's when things started to happen. Even people I know have been attacked in town when they were walking home. But the police are very supportive. I think that people here don't understand how other people are different and instead of embracing it they actually end up trying to evangelise and spread their views rather than enriching their lives with something a little different. 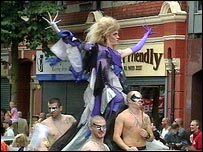 If you don't want to see what is going on on Royal Avenue [Gay Pride route through Belfast city centre], stay away for an hour - it's only for an hour every year. The Kremlin club sees itself as the heart of "Ireland's first gay village"
It's like everything else: if you don't like what's on your television switch it off. It's never offensive. There is nothing worse going to happen on Royal Avenue on Saturday than you're going to see on your TV or at any other Mardi Gras. Rio has a carnival every year. The people are partially naked. I don't think there will be anybody too naked in Belfast - for a start, the weather wouldn't hold up to it! I know gay people who have careers in accountancy, who have careers in offices where the environment is very, very much conservative. I work in a creative environment so people don't really care what you are, who you are. But it's a big deal to some people. If someone finds out that someone is different or something is strange it just spreads like wildfire. The person feels isolated and there are no support mechanisms. They're scared to come out because they're in fear of losing their jobs or persecution. I would say the situation for gays in Northern Ireland outside Belfast is extremely difficult. There's nothing outside Belfast. Most would go straight to London and live their lives elsewhere. I'm just lucky that I have a very supportive family and most of my friends are married couples. I don't have that ghetto mentality. I just live as a normal person - I must say, normal in inverted commas! You'll always get the one person with extreme views and you're never going to change them no matter what. In general, the punter doesn't give a damn what you are. On a one-to-one basis, people take you as you are. I think the problem is that there are some gay people who can't leave the bedroom in the bedroom. Straight people generally don't go around talking about what they do in the bedroom. My private life is my private life and, as I say, most of my friends are straight and I don't discuss my private life with them.